Tips on how to make the most of your time at the parks! And bonus: a list of must-see's and do's! If you don’t know, Disneyland is very different from DisneyWorld, mainly because of it’s size. Disneyland is only 2 parks, whereas Disneyworld is 4 parks. However, mostly all the rides spread among the 4 parks at Disneyworld are squished into the 2 parks at Disneyland, so you won’t miss too much if you opt for Disneyland. Since I grew up going there, I’m somewhat biased towards it. I know not everyone is as lucky as I am and can’t go all the time. But I know there’s a good amount of you who are about to go for the first time! Yay! Going with first-timers is one of my favorite things because I can see them light up when we enter the park and I know they’re about to have the best time. 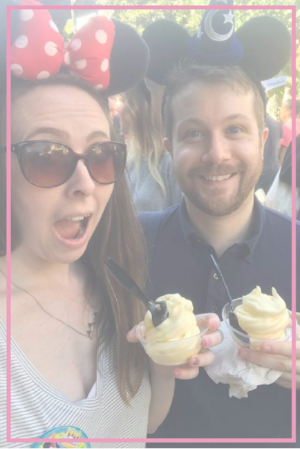 Because I love helping first-timers so much, I’ve compiled this list of not only the “must-do’s” but also a few tips on how to make the most of your time at the parks. We know Disney ain’t cheap, so you might only have 1 or 2 days. Don’t fret! You can easily see it all within this time and I’ll show you how! Note: This list does not necessarily contain ways on how to save money, merely only how to make the most of your trip (time-wise). Last March - this was Peter's first time! I know it’s not always possible due to school vacations being in the summer and over Christmas, but I can’t stress this enough. If you go during the busy time, it WILL be very crowded. It’s still possible to do a lot, but it will be slightly more difficult. For the purposes of this post, I’ll assume you’re going during the slow season. It’a also advantageous to go during the week instead of the weekend. Pro-tip: I always try to go Tuesday, Wednesday, or Thursday. I notice a significant decline in crowds on these days. (except if you go in December, it will be busy every single day). The great thing about Disney is they allow you to bring food in the park! You can’t bring ingredients to make food (like bread, cheese, meat), but you can bring sandwiches and of course, snacks. They even allow drinks! This will save so much time and money on park food. Waiting in lines can get tedious, and when it’s hot it will be miserable to do so. Having a meal at a sit-down restaurant can be fun, but takes time. Bringing your own food is really the way to go! Pro-tip: I ALWAYS bring granola bars, sandwiches, water, fruit snacks, and chips. I choose one meal and one goodie (snack or dessert) I want in the park, but that’s it. This is probably the most important thing you can do at Disneyland to be able to ride everything you want to ride. Unlike at DisneyWorld (WDW), Disneyland still uses paper fast passes (I love them!). They’re free! I think it’s a great system but might be confusing for newcomers. - A fast pass will say “Please return anytime between TIME 1 and TIME 2”. You may have gotten the fast pass at 10 am, but it’s not good until 3 pm. This means the ride is very popular and all the earlier times are sold out. You will not be able to get another fast pass until 3 pm (for any other ride). - Most rides have a fast pass, and there will be a little area near the entrance of each ride in which you will get it. You have to put your park ticket into a machine and the paper pass will pop out. Sometimes, if your party is big, someone may get a fast pass that doesn’t become active until a later time than everyone else’s. Don’t worry, the person who takes your ticket will likely let you all still go together and on the earlier time. - The rides with fast passes have a separate entrance for fast pass holders, but it’s usually right next to the regular entrance. There is a clock above it that states the times they are accepting. - There’s not really a way to know what time you will get on your fast pass. If you go at 11 am to get one, it could be for noon or it could be for 5 pm. It just depends on how many other people are also getting them. Whew, okay. That’s a lot to learn. But once you’re there, it will make more sense and you’ll get the hang of it quickly. Now that you understand how they work, here’s how to make the most of them. - The busiest rides will either sell out of fast passes, or sell out of earlier times very quickly. I went right after Cars land opened and we tried getting a fast pass for Radiator Springs Racers right at opening. The line was hundreds of people long and we didn’t get one because they sold out very quickly. Get your fast pass for the ride you REALLY want to ride (like Space Mountain) first, then go ride other things which may not typically have as long of lines. - Get a Splash Mountain fast pass. This ride always has long waits because you get wet on it and people want a reprieve from the sun. BUT! Try to get one for the hottest part of the day because you will be so happy you did. If you wait too long, however, you may get one that is active at 8 pm and then you’ll be super cold (this has happened to me). I recommend going to get your fast pass for this ride around 10 or 11 am and hopefully it will be good for 2 or 3 pm (or first, if you want it to be your first ride). If you plan on doing the park hopper (and I recommend you do), then you need to understand how to go between Disneyland and California Adventure at the right times. Unlike WDW, these 2 parks are simply across from each other and you can walk from 1 to the other in a few minutes. It’s very convenient. Like I stated, above, I go to California Adventure first to get my Cars fast pass, then I go right back to Disneyland to ride other things. I don’t stay in California Adventure at this time because I want to try to get on Indiana Jones first thing (it’s my favorite!) It’s one of the more popular rides and can get really busy, so I want to knock it out early. When you leave either park, make sure to get a hand stamp so you can easily re-enter each park later. They will not let you back in without one! Also, California adventure has far less rides than Disneyland. We get our Cars fast pass, go back to Disney for a few hours (usually until lunch), then we go back to California Adventure and we usually can knock out all the rides there in a few hours. We go back to Disneyland and stay there the rest of the time. Pro-tip: California Adventure sells alcohol and Disneyland doesn’t. We go back to California adventure around lunch time so we can get some fun drinks! If you're short on money, then staying off property is perfectly fine. Check out a map of where the hotel is and try to get one close enough to walk (easy to do, most are this close). BUT if you can swing, I HIGHLY recommend staying at a Disney hotel. Not only are they great hotels, but this will save you TONS of time. The Disneyland Hotel is a short walk away (and you get to walk through Downtown Disney which is fun) and has a great bar on property called Trader Sam's (another must do. You don't need be a hotel guest to go). Paradise Pier hotel is a short walk from California Adventure and has a super cute beach theme. Pro-tip: If you book through Orbitz.com or Cheaptickets.com, they almost always a have a 16% off coupon code which is applicable to Disney hotels. We saved a good chunk of money when we stayed at the Disneyland Hotel because of this. Overwhelmed by the idea of planning your own Disney trip? Check out this post on hiring a travel agent! If it’s your first time, you probably want to see parades and shows. I recommend picking one that sounds the best and seeing that one. If you try to see all the parades, you’ll never ride any rides and you’ll be frustrated because everyone else also wants to watch the parades and it gets very crowded. A nighttime parade is usually the best way to go because it’s much less hot when you’re just standing around waiting for it to start. Blue Bayou is by far the best restaurant at Disneyland. It’s IN the Pirates of the Caribbean ride (yes, IN the ride!). It is pricey, but it is probably one of the best meals I’ve ever had. I go there every time now because it’s just that good. You MUST make reservations! Walk-ins are rarely allowed because it’s always so busy. You will NOT regret going here, I promise. Dole Whips!! I’m sure you've all heard of Dole Whips by now – the delicious frozen non-dairy pineapple soft serve you can ONLY get at Disney Parks. I’m telling you, it’s amazing. The line to get one is always long, but it’s worth the wait!! Try to get in in line either earlier in the day or later in the day, otherwise it’s super hot just standing and waiting. There are two lines, one on the outside and one on the inside, near the waiting area for the bird show, but I find that both lines move the same. My favorite is Indiana Jones. It’s so fun and has tons of cool things to look at. It is more of a “thrill” ride so it might not be suitable for tiny ones. My second favorite ride is Soarin’ Over the World (formerly Soarin’ over California). Talk about an amazing experience. I won’t give away what happens on this ride, but I highly recommend getting a fast pass for this one! Radiator Springs Racers is another fantastic ride and kids can definitely ride it! Finding Hidden Mickey’s are a fun way to pass time while waiting in line or walking around, wondering what to do next. Most rides have multiple, and there are some scattered throughout the park. Check out a Hidden Mickey’s book if you really want to find them all! Browse Main Street! This is honestly one of my favorite things to do. It can be really busy at the end of the night, so I recommend doing this in the morning. If you’re not in a rush to run to rides or if you have a few days in the park, this can be a great way to just take it all in. Main Street is so adorable and full of tons of things to look at. It’s not great for the wallet, though, because you’ll want to buy all the cute merch! Because Disneyland and California Adventure are so small (compared to WDW), you truly can see it all in 2 days (1 day if you’re an expert!). If you’re wondering how many days to go, I’d say 2 is your best option. I went for 3 days once and the third day we just re-rode a ton of rides (not a problem obviously, but we realized we didn’t need the third day). It’s all about prioritizing what’s important to you – check the map ahead of time on their website. This will give you an idea of where things are and what rides sound enticing to you. And I’ll state it one more time: take full advantage of the fast pass system! Learn it well and figure out how to manipulate it to your schedule. It will help you SOO much, I promise! For those going for the first time, I hope this list helps you feel a little less overwhelmed and little more prepared for navigating Disneyland. Obviously, this list could honestly be endless, but I decided to write about what I think are the most important things. Is anyone going to Disneyland for the first time anytime soon? Did you go for the first time recently? Tell me about it in the comments! I’d love to hear your stories and tips of your own.